Office Depot will open at 6:00 am on Friday. Many of these deals will be available online too starting at 4am PST Thanksgiving Day. Here is a sneak peak at the Office Depot Black Friday Ad. Below are a few of the top deals from their ad. If you see something in their ad remember to price check with online retailers like Amazon.com and Walmart.com who have been adjusting their online prices to price match before the other stores open! 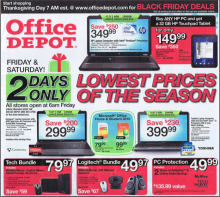 Offers Nov 20, 2011 in BlackFriday, OfficeDepot · Expired!